My current artistic process begins at the initial moment when I have an 'idea' for a composition. I usually make studies in my sketchbook, small studies typically, ink pen or pencil, sometimes a basic colour wash. As I don't always act on these ideas for compositions straight away, for me this is akin to writing things down in a diary perhaps, so I don't forget. Consequently, I usually have an ongoing library of these 'ideas', 'plans' for paintings. The initial sketch for 'Graphic Speed'. When I decide to develop one of these ideas further and in order to maintain a nod towards the 'hyper/super/photo' – realism – style/genre, I develop a 3D visualisation in modelling and rendering software. This culminates in what could be described as a virtual 3D stage set. 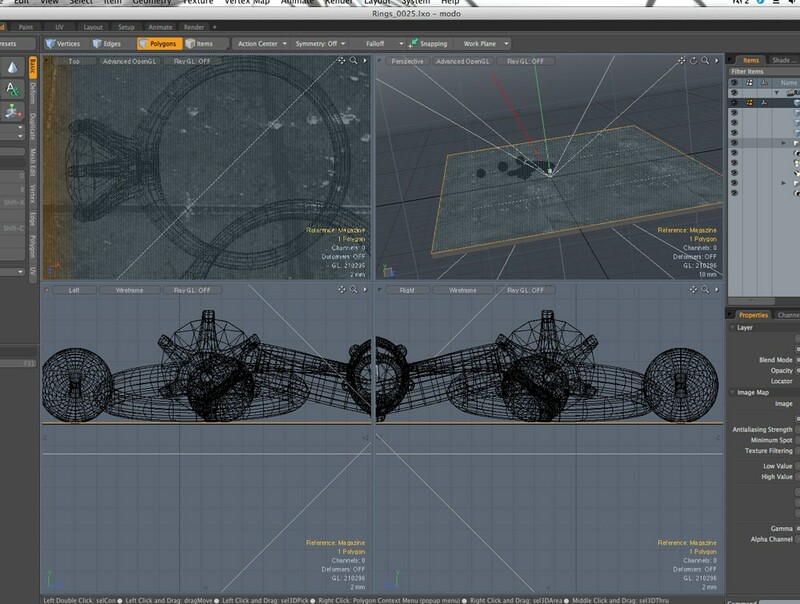 I can move lights, move the viewpoint etc. Once I am content with the scene I then have a tiny section of an alternate or surrogate world from which to paint. If I had developed my idea through photography, either through straight photographs or artificial constructed photo 'collages', it is feasible I could still end up at this same point. So although I use software tools to create my own reality at the moment, it is only part of the 'means' to reach the 'end'. 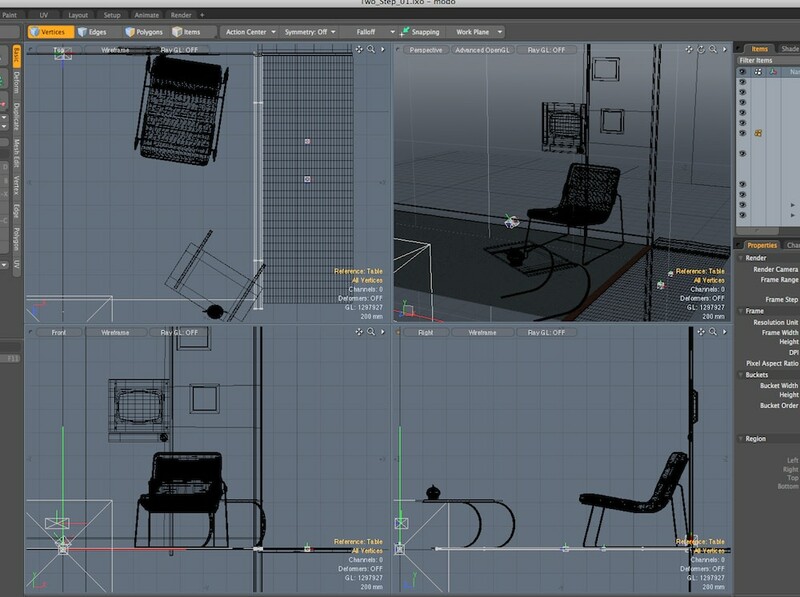 3D visualisation in modelling and rendering software. Faced with the bare canvas, I begin drawing from the scene I have constructed. This is quite laborious as I do this by hand, a lot is completely freehand, but my eyesight and concentration levels are not what they were, so I do measure some distances and in particular plot points on some of the complicated curves so I can describe an arc better. I do lean on some of the techniques I learned at school in my technical drawing classes. 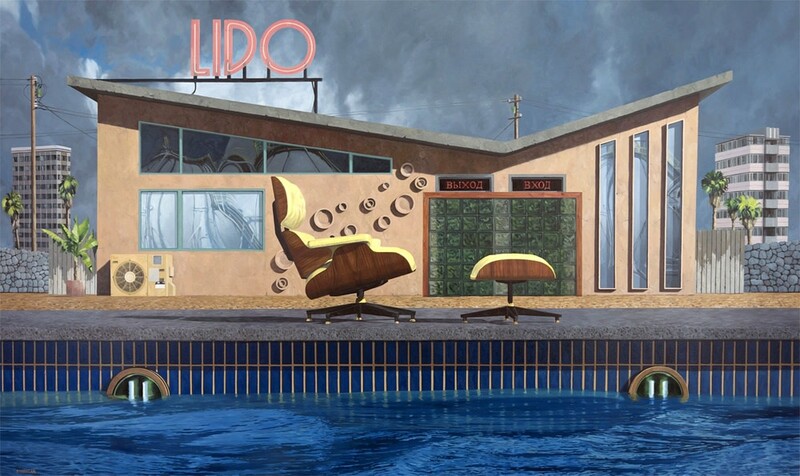 See below for an example of this from an earlier painting of a lido - 'Almaz 104'. The painting can then begin, and despite casual appearances of unforgiving tightness or exacting rigour, I do find room for interpretation in this part of the process. Elements still move, each brush mark does matter and can add or detract. For me there is still a sense of jeopardy – well I suppose that is being slightly dramatic but at least in the sense that it could still go wrong and it would result in much scraping back and reworking. 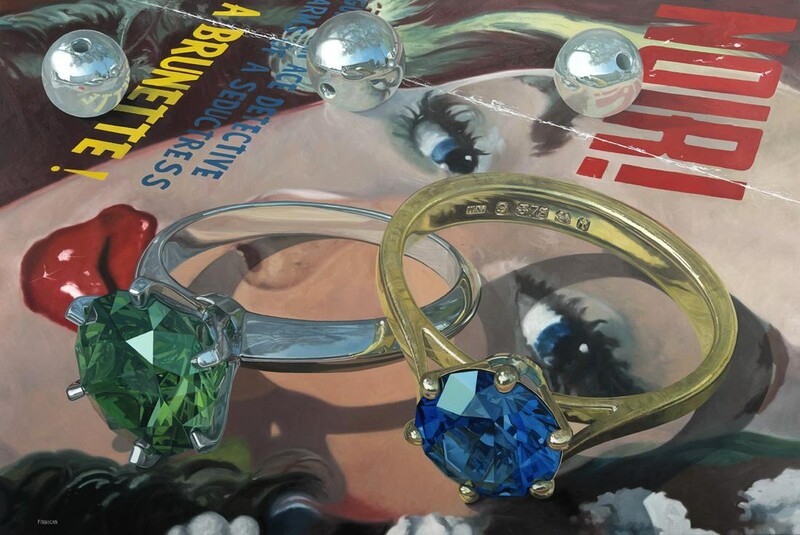 What is more, I think there is room for a more painterly style within the confines of exactitude or photorealism or other styles of extreme realism, etc and that it can definitely enhance the work, give it character, personality. I feel strongly about celebrating the act of painting. 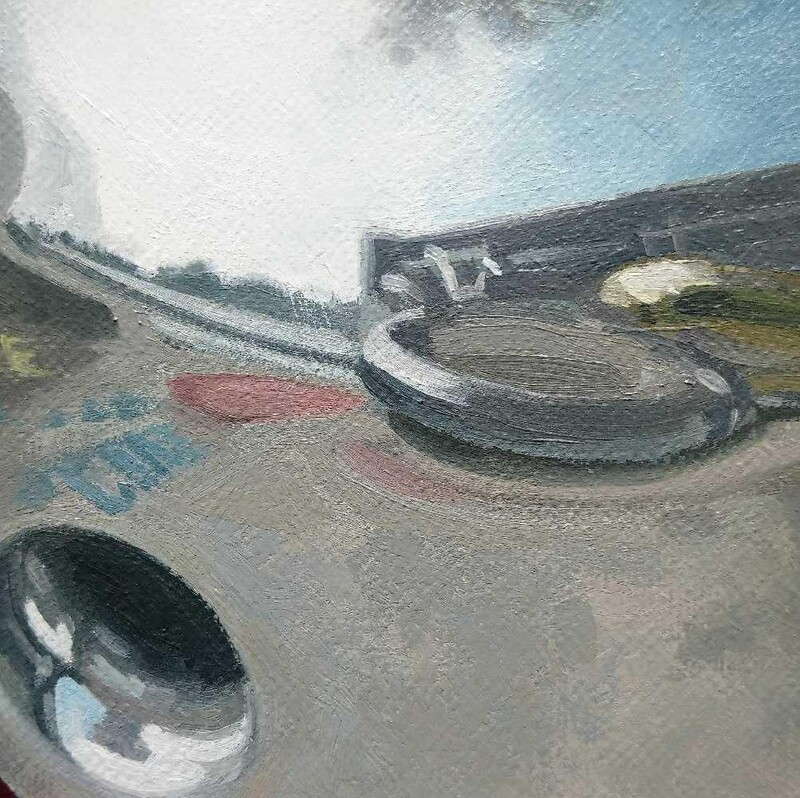 A detail from Finnigan's latest painting 'Speed Graphic'. 'Speed Graphic' Oil on linen, 80 x 120 cm. My work has evolved a lot from when I first began making drawings and keeping sketch books. Actually I still have some from when I was 9 or 10 years old. Although I had sketch books prior to that. It is an ongoing process for me and I have never known any different really – like a disease I can't shake off. Later when I was still young, for a while I made work (both large drawings and paintings) very influenced by aspects of Futurism / Vorticism / Dadaism. I wanted to explore movement and juxtaposition of arbitrary objects or figures in space or even – non-space. It didn't matter which, it was the physical act of drawing or painting combined with the intention, that sometimes gave me the result I was looking for. The spectre of Surrealism/Dadaism hangs over my work then and now. It did, even if in an innocent / misunderstood way when I look at my childhood sketchbooks. 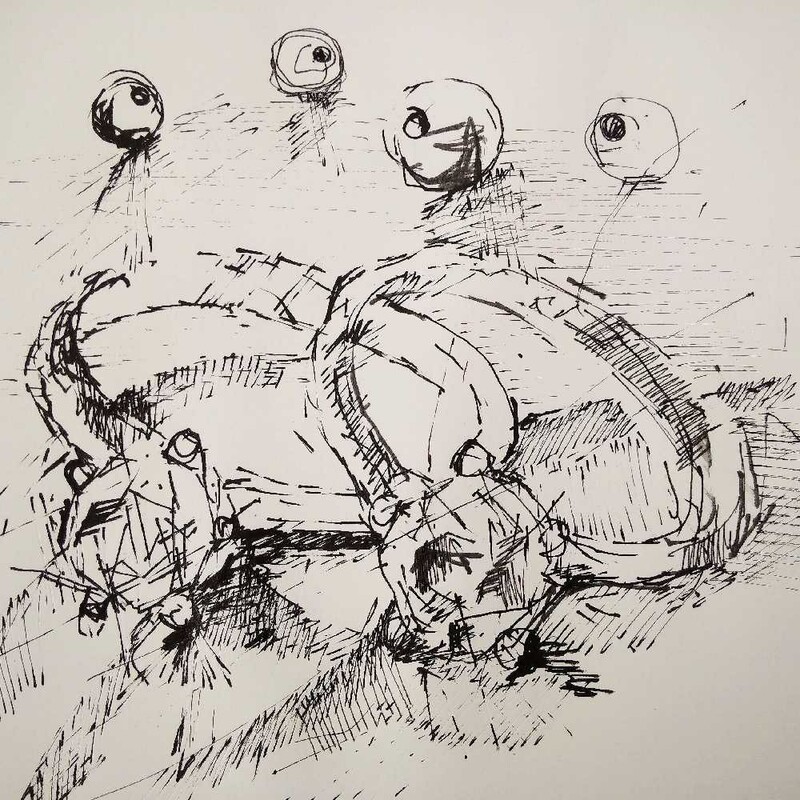 Following the exhaustive but satisfying investigations of movement and arbitrary juxtaposition, I retreated to produce small off the cuff, quick sketches, daily, just whenever I could. It seemed almost relentless for a while. 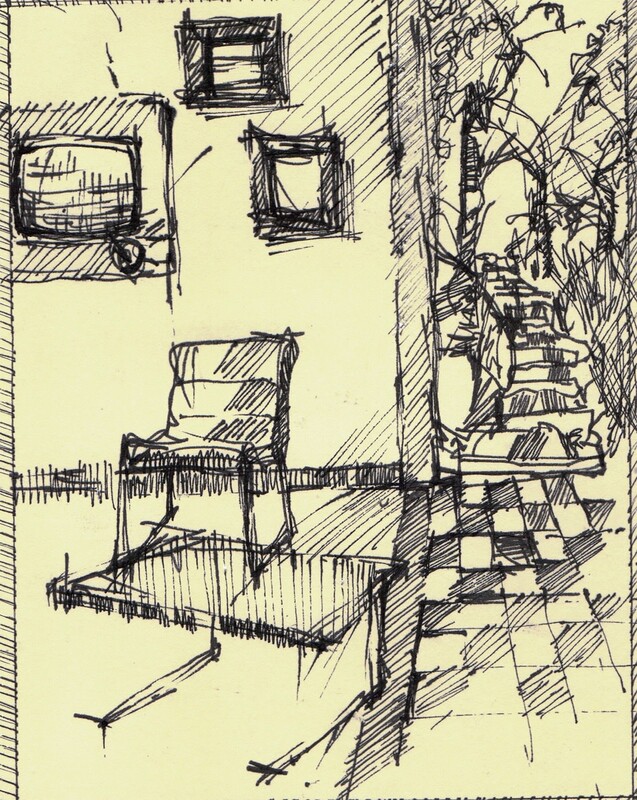 Even when I worked as a bus driver years ago, I took my sketch books and drew whatever caught my eye, although not of course while the vehicle was moving. Retrospectively I am glad I undertook this approach as it helped me a lot when I moved into producing work in a realist style, albeit I now make studies and sketches at a much lesser frequency, yet they form an important function in informing the final work. When did you start exhibiting with Plus One Gallery? Has this relationship influenced your artistic development? I began showing with Plus One in their very early days, in the first gallery space they had in Seymour Place. I think the relationship between gallerist and artist is important and can be influential to both parties in a symbiotic way, I feel this is when it is at its most successful and fruitful. I think Plus One has influenced my artistic practice in that I have been able to explore the boundaries of the differing genres of 'Realism' and what I have produced has always been given a fair opportunity to be shown. Umberto Boccioni – a genius in my opinion and he was bonkers. Within your work, you have started to explore the idea of NON-reality. Creating a surrealist painting of a scene which has never existed. What is it about this, that inspires you? I suppose imagination can be seen as frivolous, in a painting genre which is defined by it's necessary rigorous process, investigative qualities and meticulous nature. Yet once safely inside this ordered, controlled environment we see it is a cage and bizarrely from within the cage we sometimes might want to break out. This happened to me, I like some of the order and the rules but I want to present an investigation of something else, imagined, dreamt, someone just shouted something, the D.J was talking incessantly on the crackly radio, a memory came back to haunt me briefly and I cringed, a barely heard noise on an uncomfortably cold morning, an idle thought even, these things and more are what inspire me. Its hard to shake off a lifetime of influences and experiences and I want to show the juxtapositions still, as I had done in my youth, but working within a known framework. This time precise but not too precise, assume the familiarity of the genre but subvert the depiction of reality, that the viewer (if there is one) expects to see, through the action of depicting a NON reality/ masquerading. You have said this allows you to go back to the traditional artist practice of using your own creativity to decide what you want to say and show. Rather than waiting for a scene to appear. Where does your inspiration come from and how do you create these collaged scenes? It is difficult to say where inspiration comes from, inspiration especially within the art world is often regarded as something ethereal, magical, associated with 'masterpieces' and as such sometimes is perceived as having an untouchable quality. For me it is more mundane, constant , ever present, I personally believe in bad inspiration as well as good inspiration and even beige inspiration, among other types. However, it is a starting point and the subsequent manifestation of the inspiration is largely a mechanical yet intuitive process. This is really concerning the idea that the process of making a realist painting is not just driven by accident or governed by physical limitations. If the work is driven only by a photograph, this implies a lot of restrictions, not only through the limitations of photography but through limitations of actually being able to be in the place you want to be at the time you want to be there. Of course these restrictions can be overcome and sometimes you accidentally happen to be in the 'right' place at the 'right' time. I have experienced this myself in the past indeed I have made paintings that I have been happy with, even through accepting a compromise. But, I felt for me this was not a sustainable long term approach, I had never practised my art like this and I did find it very frustrating on a personal level. So I was inspired to change my approach. To move forward as painters and artists, we find ways to compensate and I have always been naturally driven by concepts and ideas, so this became a good fit for me and slotted in easily, realism is a non-moving target, so together with other tools as already described, I made it happen as I wanted it to. However, these methods and tools are just that, I view them all in the same way, for example if I want to make a painting and after completing my initial studies and drawings, it transpires that I know of a place I can physically go to and photograph I will do that, the salient point for me is that I am able to utilise different methods to achieve the result that I am aiming for. You have talked about wanting your work to have a slightly reflective or melancholic feel. Is this still something you want to create in your non-reality series? I am not sure if the reflective or melancholic feel of some of my works was a deliberate action taken or a natural by-product of the “inspiration/creative process/mechanical act” of painting. I like to think it is the latter, as this implies there is an ongoing natural thread running through all of my work, stretching right back to the beginning and also moving forward. I think it is still there in my non-reality series, but not always, at least I think it is not the major defining feel of the works but maybe flavours them. 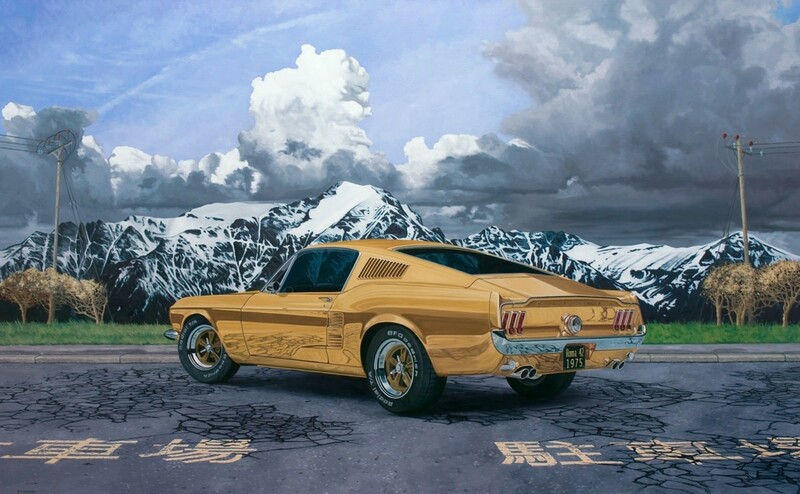 'Grand Tour' Oil on linen, 105 x 170 cm. 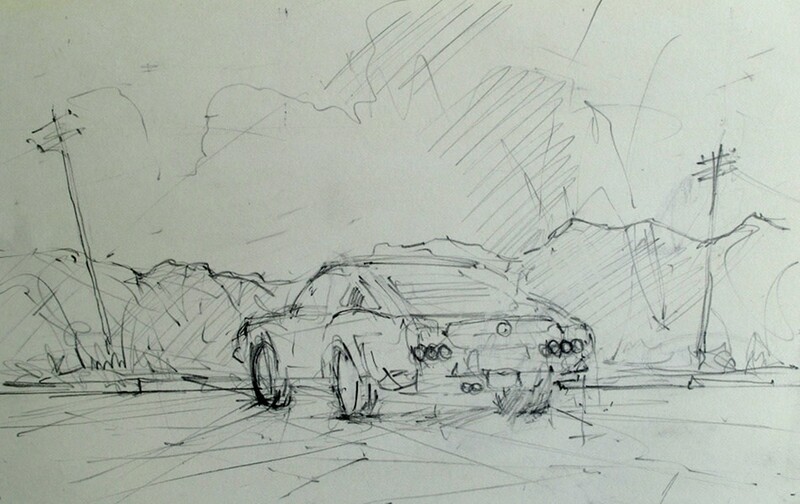 Preliminary sketch of 'Grand Tour'. 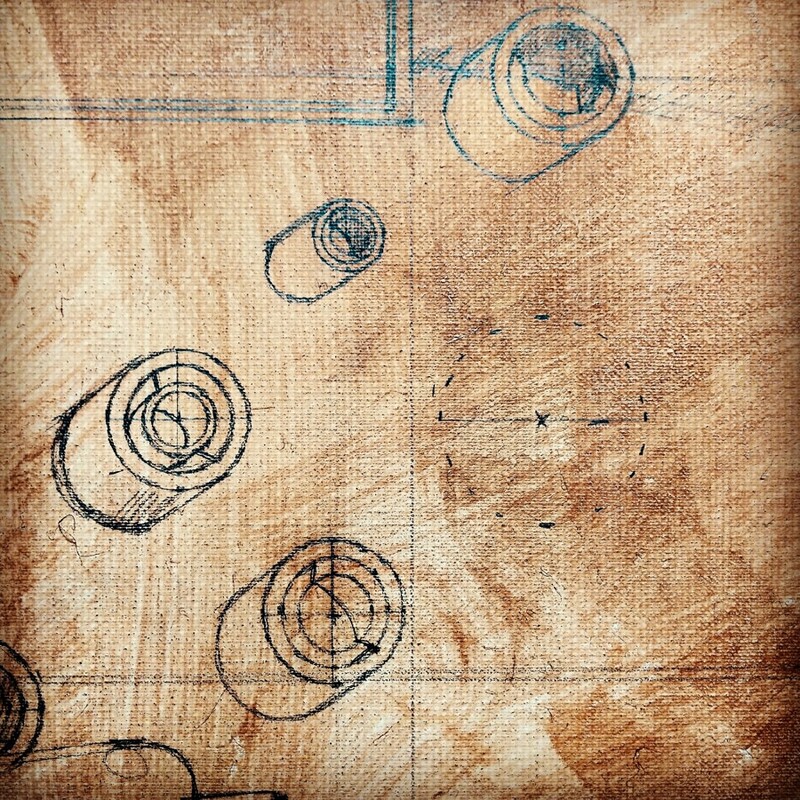 A common motif within your previous works are tables in cafes along with the domestic objects you find on them, salt and pepper, napkins, for example. What is it about these objects that makes you want to paint them? 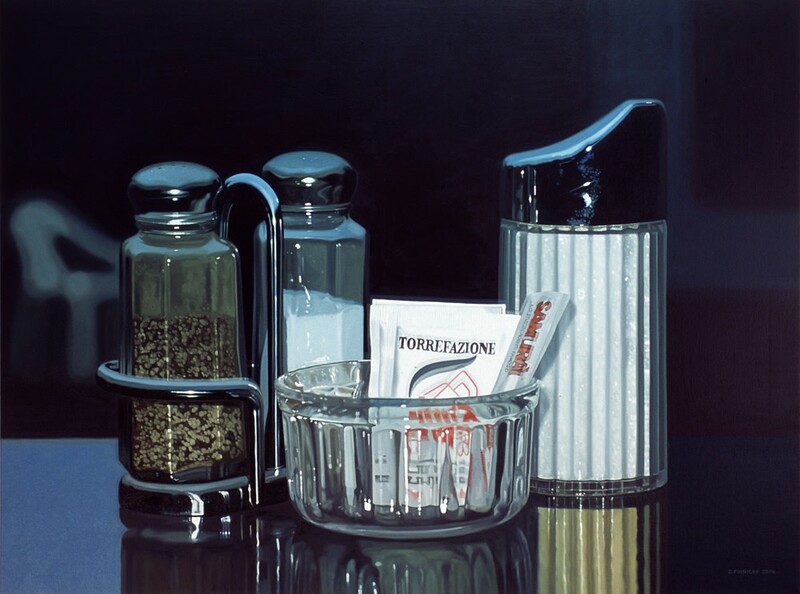 Looking back I did use a lot of these objects and/or find situations in which they were common, these type of objects were heavily used by some of the early photorealist painters, which did influence me. I am not sure of the motives of some of those artists for their interest in these objects although I do know some of those guys had quite a radical agenda, which is often overlooked today. I actually saw a visual language within them. A scenario that was understood by most people, experienced by most people in some form or other and actually quite beautiful, poetic even. 'Samurai' Acrylic on linen, 91.5 x 122 cm. Does living on the North-East coast of England influence a lot of your work? Yes, in an indirect way, I have noticed locations here and made paintings from those actual locations, more so in the past than now, but I wouldn't close my mind to the possibility. I always feel there are possibilities for compositions. There could be situations I might come across locally where I notice a certain quality about that place. So I make a note or a sketch and then use that as a starting point. It may only be a small detail, sometimes that is enough. 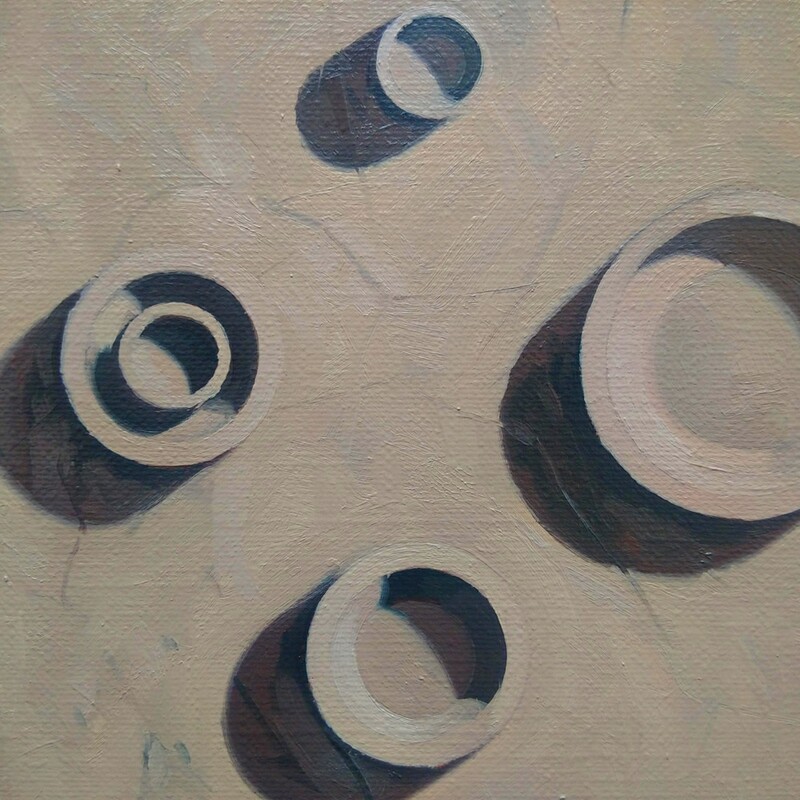 A good example of this is in a recent painting I made – 'Lubitel II'. This work was a construction made in the manner detailed above, mainly on a computer which in turn was made from sketches and studies. Yet across the threshold in the painting I needed some rural scene, maybe some rough hewn stone steps leading up and away. I knew locally where I could find something like this so I used this local scene to mesh seamlessly with the composition as a whole. The images below show the final painting and a screenshot for the 3D development work and one of the initial studies. 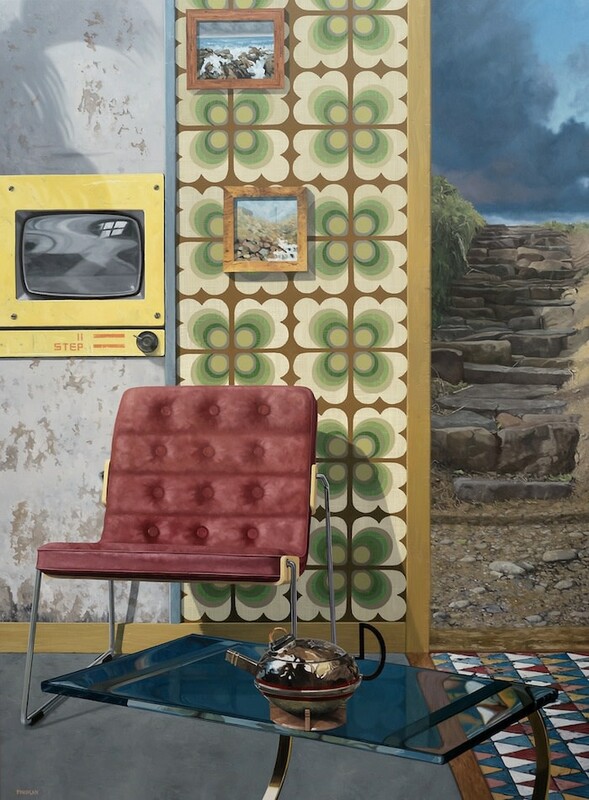 'Lubitel II' Oil on linen, 137 x 101 cm. You have been described as a slow worker. Often taking a long time to consider what you are going to paint. Do you see this as the most important part of your creative process? Yes, that is a fair point, though I do not see it as an important part of my work, I actually think it is a hindrance. I didn't always work like this and have tried to be more pro-active and productive in the last 10-12 years or so but it's like fighting the tide, as I get older it becomes seemingly more difficult for me to work quickly. However, I do try and remember that since adopting new working modes, which involve a large amount of pre-planning and subsequent construction work in the form of 3D models and all the rendering and lighting environments etc, I have more than doubled my own workload. That is not to complain but to remind myself, it is worth it for my own artistic sanity and that I must try harder!